If you think this looks a lot like the Ancient Transport Urn from the base game, then you… are absolutely correct. 😉 This is the Ancient Transport Urn, only without the column and reduced in size so you can put it on a table or a shelf. It’s base-game compatible, but it can be placed on all surfaces – including, but not limited to, OFB shelves and deco slots like on dressers and mantles. The table urn is slaved to said Ancient Transport Urn, so any recols you have for the in-game urn will work for the table urn as well. 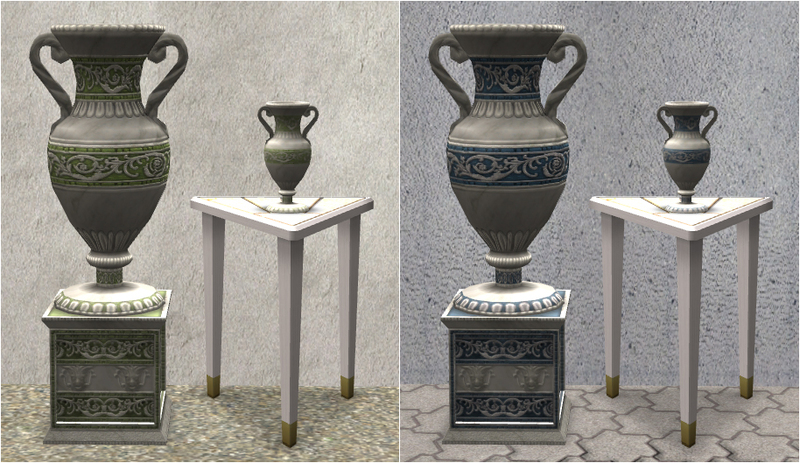 Also, if you wish to recolour the table urn, you should recolour the Ancient Transport Urn instead. The original texture for the Ancient Transport Urn is quite large, but I didn’t want to lose quality by reducing it in size. Thus, the recol files are a little on the heavy side, about 1 MB each. This entry was posted on 15 September, 2011 at 17:15	and is filed under BUY MODE, Decorative, DOWNLOADS. You can follow any responses to this entry through the RSS 2.0 feed. You can leave a response, or trackback from your own site.